The New Orleans Feetwarmers recorded 6 titles in September 1932. 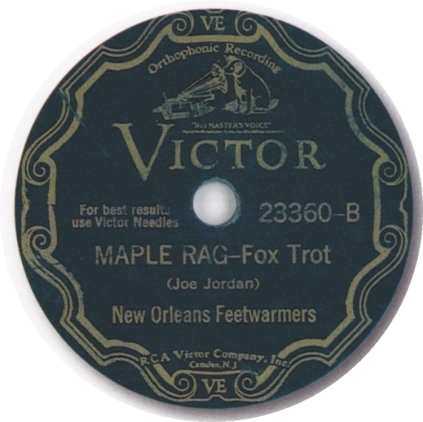 On Victor 23360, the title Maple Rag, Foxtrot by Joe Jordan is stated. Jordan (1882 – 1971) actually composed this song but the tune played by the Feetwarmers is Scott Joplin’s much more well-known Maple Leaf Rag. This mistake was probably made by Victor since Ladnier and Bechet certainly knew the song title and the composer. Perhaps the mistake also can be explained by the fact that Sweetie Dear, recorded the same day, also was composed by Jordan in collaboration with Will Marion Cook. This mistake clearly was observed by Victor and most reissues of this recording bears the title Maple Leaf Rag composed by Scott Joplin. This mistitling has not been noticed by discographers. In the discography to “Traveling Blues,” the title is given as Maple Leaf Rag but there should have been a remark added about the original record mistitling.